The novel starts with a fire at a family house that was most likely the result of arson. Family members immediately have a suspect - family's black sheep Izzy. This way of presenting the story allows readers to pay close attention to all the events that lead up to this situation. Events and complex family relations. 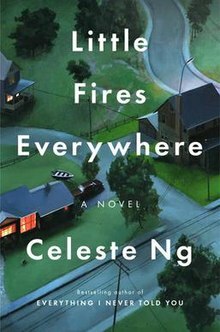 Because at its core, Little Fires Everywhere is a family tale. We have the Richardsons - wealthy and seemingly happy family living in a large house. Mia - a photographer, artist, and a restless soul who constantly changes her address, starts renting part of their rental house. She moves in with her daughter, Pearl. Over time she notices that Pearl spends most of her time at Richardsons' place and openly admires their daughter Lexie. Mia is soon offered a job as a housekeeper there and decides to take it in order to have a chance to check on her daughter there. There are many complex human relations here. Mia's difficult past comes to haunt her as Miss Richardson begins investigating it. Celeste Ng creates lively, credible characters. Richardson children go through their maturing and face challenges involved with it face-on. While they seem to be a perfect family, moments of crisis reveal cracks in that structure, both on personal, and on emotional level. I picked this novel totally randomly and this is not the type of prose I typically read but it was surprisingly enjoyable nonetheless.